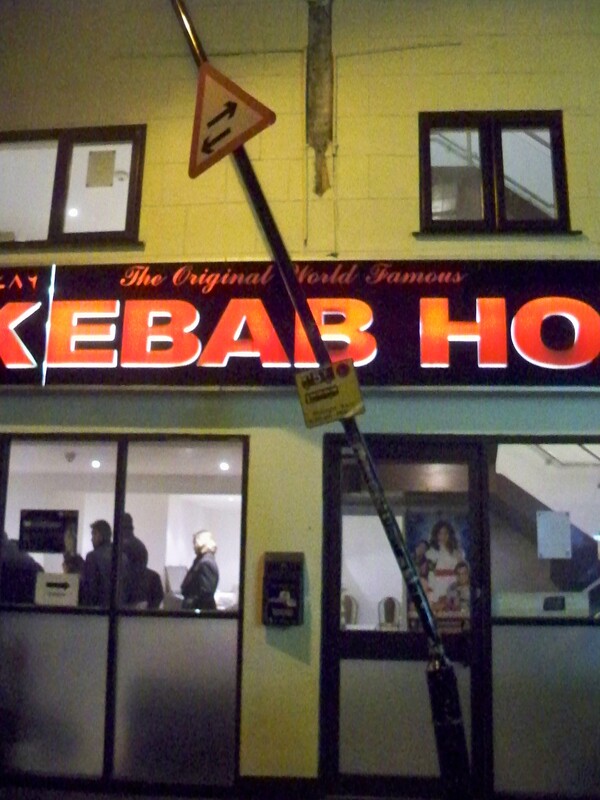 Not being a fan of fine dining in London, I tend to head to Whitechapel for a cheap curry. Not only is it easy on the wallet but the area has some of the best curry houses I’ve ever been too. These are my favourites in order of preference. My Google map of London is here. 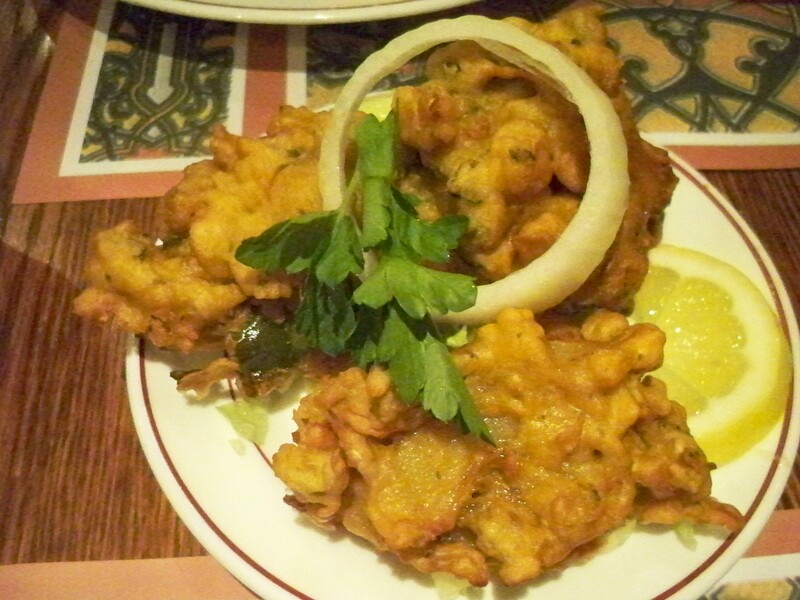 Needoo’s (Intermediate A-) at 87 New Road in Shadwell is my favourite. It’s the best for food (great curries, sublime breads) but the service isn’t as cheerful as it was when it opened just a few years ago. The Bollywood surroundings give it a bit more atmosphere than the others, and you don’t have to queue. 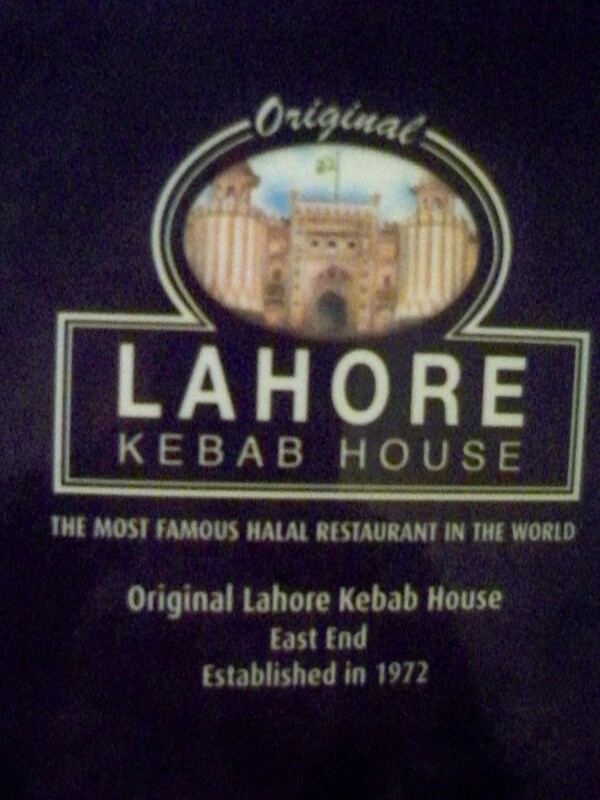 The Lahore Kebab House (Elementary B+) has been a legendary East End destination for lovers of good Bangladeshi food since 1972. Whether it deserves its self-awarded title as ‘the most famous Hal-al restaurant in the world’ is another matter. The place is certainly popular, with queues down the street on weekend nights.Fortunately we arrived early on a Thursday evening and were seated by the head-mic wearing greeter within a couple of minutes of walking in the door. The decor is downmarket, plain and simple cafe-style, except that it’s in a very large room. Every one of the 100 or so seats seemed full when we were there, most noticeably with big groups of raucous middle-aged Bangladeshi men enjoying the bottles of Johnny Walker Black Label that the BYOB policy allowed them to bring in. 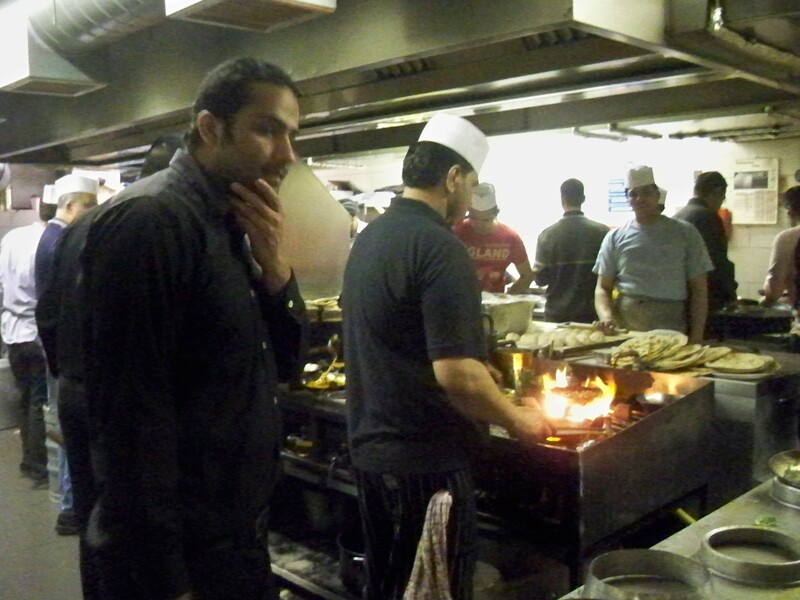 On the way to the table you pass the kitchen with a small army of chefs labouring away over rows of pans. 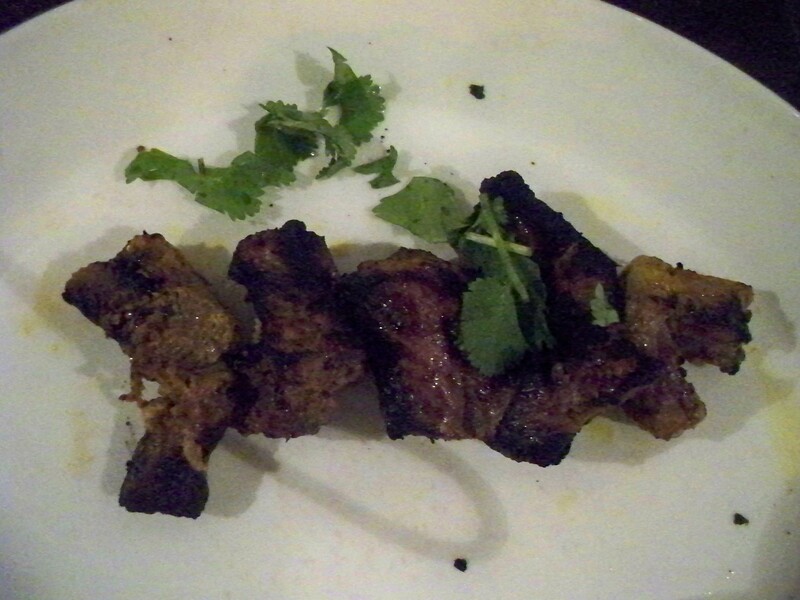 A quick survey of the tables told me that the lamb chops were the starter of choice. Sadly though due to one of several language confusions with our waiter these, along with any sign of a popadom, were not forthcoming, although we did get a plate of wilted salad and a bowl of yogurt to look at while we waited for our other starters. 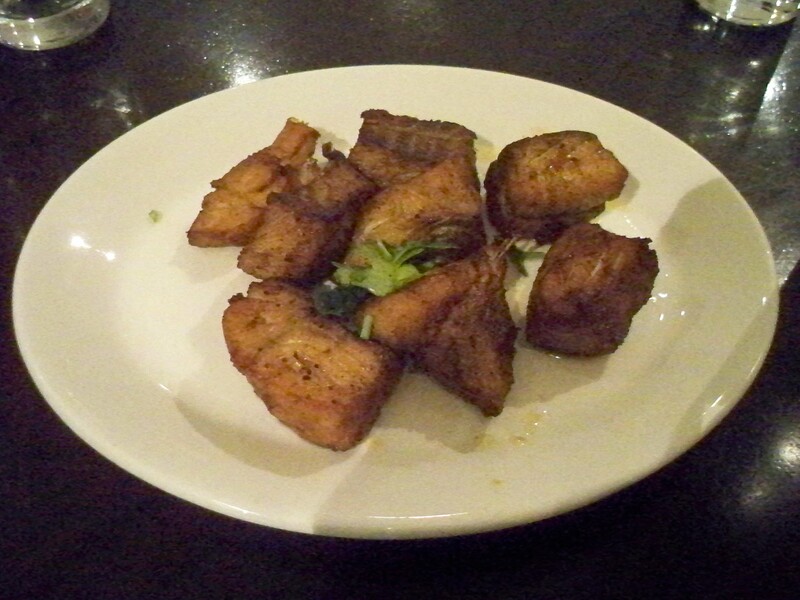 Although these were poorly presented, slapped on the plate rather than arranged in any way, they did include some delicious chunks of Masala Fish (B), a small but tasty Mutton Tikka kebab (B) and something called Chilli Mogo, which we tried because we’d never heard of it. 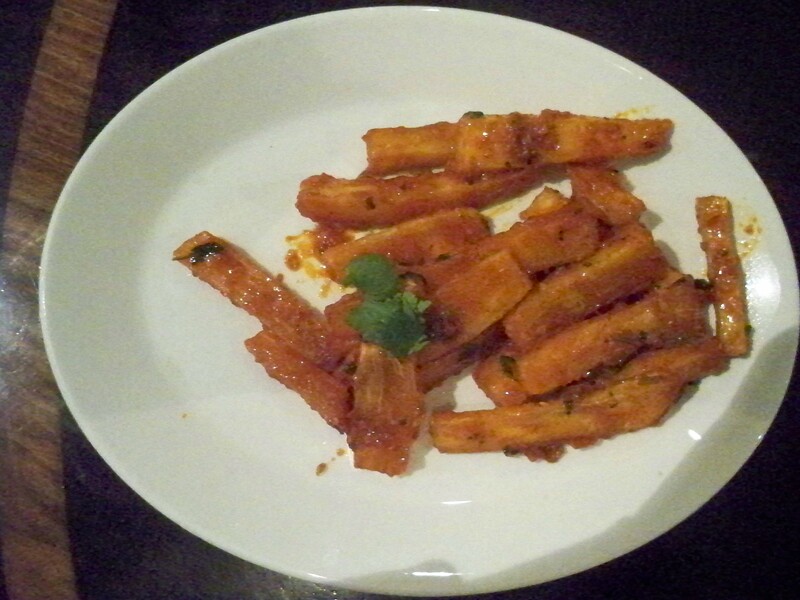 It tasted and looked something like parsnip to us but our struggling waiter tried to tell us it was potato (I later discovered it was cassava). It was interesting and tasty, but we couldn’t finish it all (B-). The mains were pretty good too, the Lamb Curry (on the bone) being a good choice (B+). …and the Saag Panneer was fine but unspecial (B-). 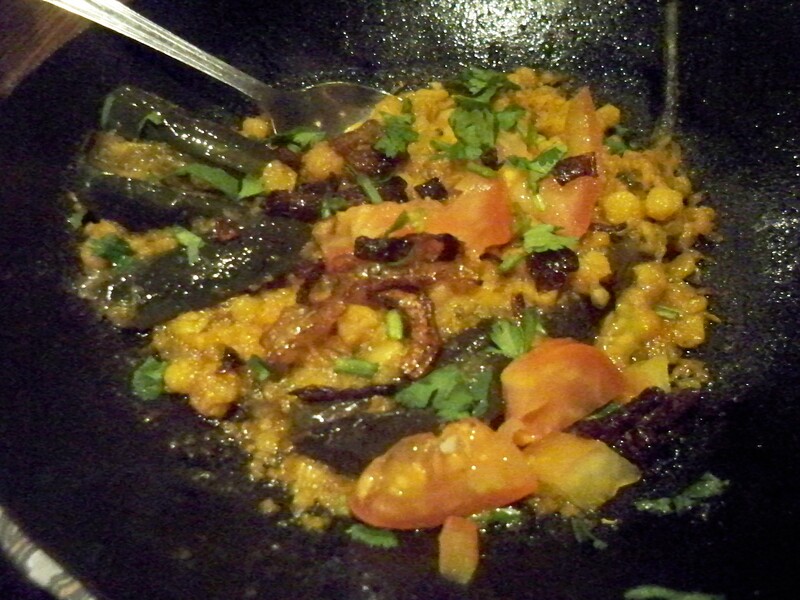 The star, as so often, was the Taarka Dahl which had a slightly unfamiliar but sublime spicing (A). 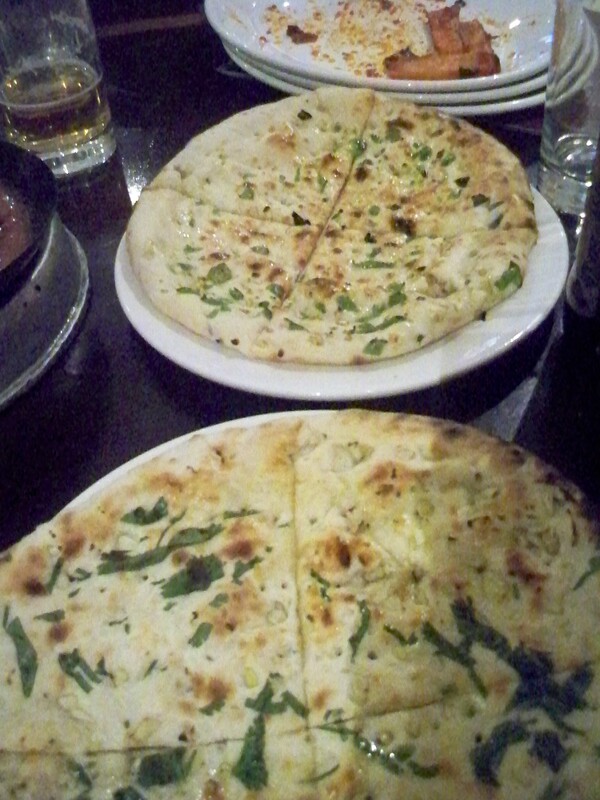 The Coriander Naans were nice as well (B). So the food is good but not the greatest (although better than anything I had in Bangladesh!) but at £15 a head for seven dishes with rice and naan you can’t really complain. You can get drinks from the corner shop over the road (large Cobras are £2.50). I’d definitely come here again, but try to make better selections next time. Two weeks later and I’m back in town again, this time to check out Tayyabs, another famed curry spot that’s been packing them in since 1974. Again we grabbed a few Cobras from a shop on the main road before we came. The queue inside on this Saturday night was insane, as usual, running the full length of the restaurant and spilling out of the door. There must have been over two hundred people crammed into their seats with forty others standing waiting to take their places (Overheard: ‘I don’t queue for clubs but I’ll queue for this place!’). Fortunately we had booked ahead and were seated by a polite greeter (not everyone’s experience on some forums but maybe they didn’t deserve it) within five minutes of stepping in the door (although I have waited for twenty minutes before, with a reservation). Compared to the stark walls of its competitor, the lighting is lower here and the rooms smaller, making the atmosphere (once seated) more relaxing. After some preliminary popadoms (served with mint yogurt, chutney, an amazing tomato and chilli dip (A) and a wilting salad) and Sarah’s very pleasant Onion Bhaji (B), Stuart and I were reduced to groans of pleasure as we tackled a joint plate of wonderfully delicious Tandoori Chicken (A+) and sublime Lamb Chops (A+), which have to be some of the best we have ever tasted. Our mains were recommended to us by a friend and weren’t apparent on the menu but the waiter seemed to know what we wanted. The vegetarian Karahi Mixed Veg (B+) and Aubergine Dahl (A) were great too and Baby Chicken Karahi was another winner (A). 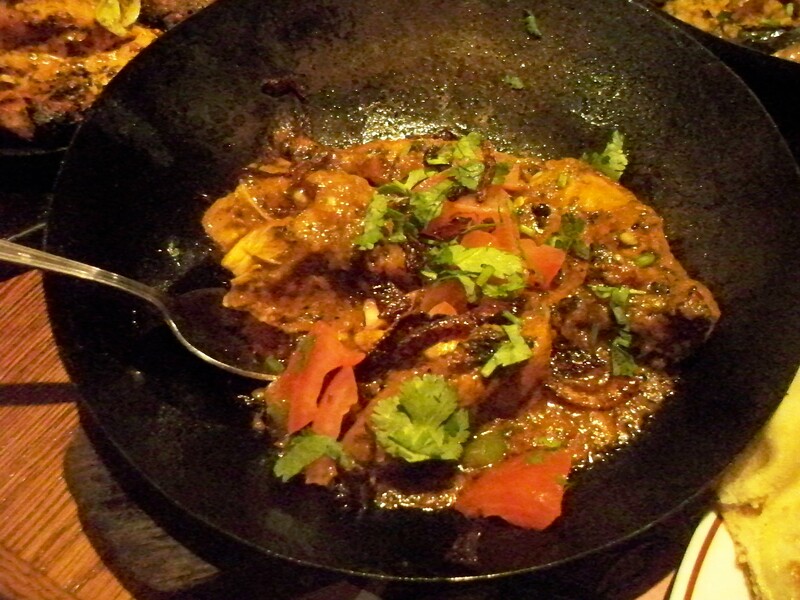 A karahi is a big pot, like a flat bottomed wok, that the curry is cooked and served in. The rice was perfect and the garlic naan was crispy yet soft. Seeing all this on the table together (everything arrived simultaneously except the bhaji) was quite daunting but unbelievably we did the lot in. The restaurant has a sweet counter with a huge array of Pakistani sweets which, although very pleasing to the eye, were a bit too bulky to contemplate putting in our bulging bellies so soon. 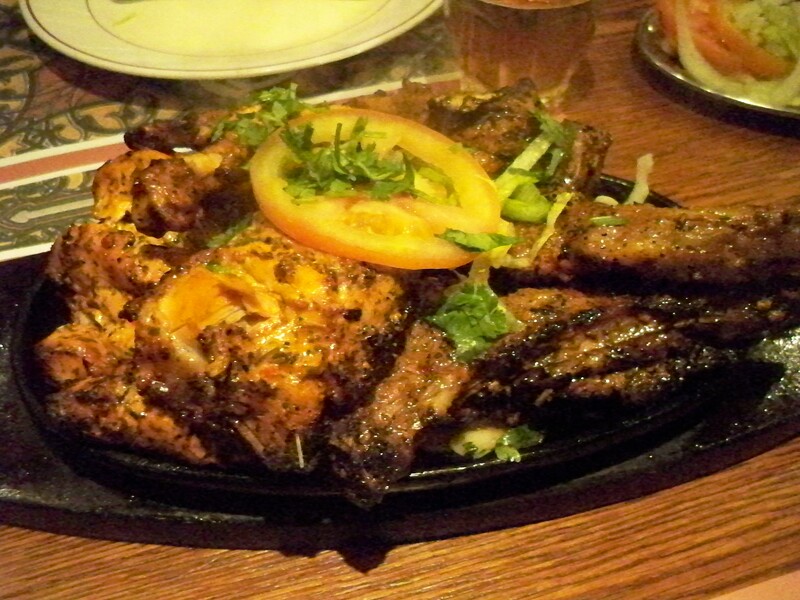 The bill came to £50 for three, slightly more than at the Lahore but then we had less meat there. Good luck getting in!